30 year old Cambodian woman with pulmonary & pleural TB, with profound AIDS immunosuppression and severe wasting of weight. Researchers in Cambodia and at Children Hospital Boston are unlocking the secrets of the immune system to find better treatments for patients co-infected with tuberculosis and HIV. The results of their international collaboration were recently published in the journal AIDS, and featured in Vector, the science blog of the Children's Hospital Boston. The researchers studied patients involved in the Cambodian Health Committee's (CHC's) landmark Cambodian Early versus Late Introduction of Antiretroviral Drugs (CAMELIA) trial, a clinical study in Cambodia supported by the US National Institutes of Health (NIH) and the French AIDS agency (ANRS), that determined the optimal timing of treatment for HIV and TB in co-infected patients. Nested within CAMELIA was a basic science investigation, the CAPRI-T (Cambodian Paradoxical Reaction Immune Study-T cells) study. The goal of CAPRI-T was to understand why some patients receiving the dual treatment for TB and HIV initially improve, but then get sicker with a serious and potentially life-threatening inflammatory condition. The condition, immune reconstitution inflammatory syndrome (IRIS), occurs when a patient's recovering immune system reacts violently to their TB infection. In the CAPRI-T study, researchers collected blood samples from CAMELIA trial participants, both before and after treatment. The investigators then measured dozens of immune cell markers and cytokines in each sample. The results showed that patients who developed IRIS started treatment with a different assortment of immune cells compared to those who did not get IRIS. In addition, the researchers found that people with the IRIS-related profile responded better to treatment overall. 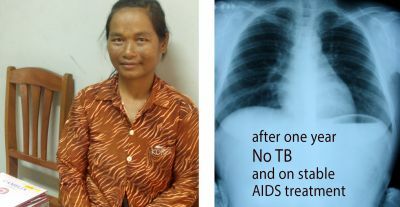 (Left) X-ray at 1 year after TB cure and on stable AIDS treatment. (Right) Patient with normal weight gain, recovering immune system, and undetectable HIV in her blood. The results will help doctors understand which patients are at risk of developing IRIS during treatment, and which patients may respond better to treatment. The work also gives hints to how the immune system can best fight off TB, which may be useful for developing future vaccines. "The CAPRI-T study is a perfect example of our delivery and discovery model," says Anne Goldfeld, MD, GHC co-founder and a principal investigator on the study. "At the same time as we are offering the highest standard of care, we are also able to learn about the basic biology of the immune system in this special population of co-infected patients. From this study, we have learned the type of immune response we want to enhance for TB cure and survival, and that will lead to better treatments for TB and for TB/HIV co-infection". The CAPRI-T study was made possible by grants from Wallis Annennberg and the Annenberg Foundation, John Moores, the French AIDS agency, and the US national Institutes of Health.